Engineering is about making things. For me, it is incredibly satisfying to conceptualize something and then make it exist and work as intended. I think that is why 3D printing technologies have captured my imagination - they are a step towards a Star Trek style "replicator". They offer the promise of shortening the loop between concept and reality. I've been dreaming of different projects for the DMLS process for over three years now. A couple weeks ago, I took the plunge and had a chamber printed in 15-5 stainless steel. The first picture is the CAD, the second obviously the manufactured result. It really is a thrill to send electrons across the country and open a box a few days later to find the electrons made metal. Now, some of you are saying "but you can do that with conventional machining" and you are right. But having a part machined has a certain activation energy - it requires a non-trivial amount of effort and skill. 3D printing is still not effortless - there are rules about what geometries are printable and of course you have to be able to generate a 3D model of your part. But the barriers are much lower. And there is also the fact that it can make geometries which are expensive or even impossible with conventional manufacturing techniques. It is still expensive - my part cost 4 figures even though it is quite small. In fact, it represents the larges single purchase I've made to date on my rocket hobbies. But as with any other process, buying in quantity is cheaper. Everything in grey in the CAD picture came as is from the DMLS machine. As you may notice it is a regen chamber and instrumentation ports are integral to the DMLS part. Threads for the spark plug and inlet fitting were printed slightly undersized (extra metal) and then I cleaned them up with a tap by hand. The part came out more or less as I drew it, although there were some imperfections that affect the design. I'm talking with the vendor about ways to modify the design to avoid those problems on future builds. Testing will follow soon. Had this been my "day job" I could have tested the motor the same day that it was delivered. Installing fittings and tapping out the holes took about an hour of slow work. The mounting ears fit directly on my stand as is. Unfortunately, life is a bit busy these days for me. And I still need to get some thermocouples for coolant temp measurements. It looks like the chamber is one integral unit. What about your injectors? 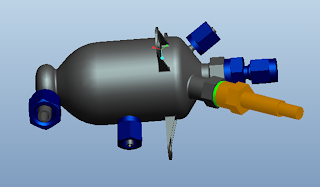 Were you able to make the injectors in a fashion that you thought would result in good-enough atomization of the propellants? What propellants (if you don't mind)? Propellants are N2O and Propane. Everything in grey in the CAD picture is printed as a single part. Very cool. How much did it cost to get this design 'printed'? It looks very convenient but the cost might be an issue. This is the awesomest. So those tube stubs were actually printed from 15-5 stainless along with the chamber? And they matched the tube sizes well enough for swagelok ferrules to seal? The surface looks a little rough which is not surprising with the laser sintering. Just wondering if you smoothed the outer surface of the tube stubs before swaging the ferrules on. By the way, have you seen the video of Markus Kayser's Solar Printer? I think something like that would be ideal for habitat construction on the moon or mars. This is very interesting. I arrived via MAKE's blog. I work as a tech for one of the big industrial laser companies. We have bits of DMLS demo pieces floating around our lab but I've never seen an entire part built via this process. We use DMLS primarily as an additive process to build or enhance existing 3D surfaces. I wonder if it would be more efficient to fab the 'easiest' part of this engine by conventional means and grow the more difficult parts via DMLS. Or rather I wonder why that's not been found to be the most efficient way to do it. This is a really neat use of DMLS (one of Paul Breed's interviews on youtube inspired me to try this process out for wind-tunnel models in 17-4; works quite well). Which vendor did you use for this part? Wow. That is just incredible. One thing though, if this is "just" your hobby work than you don't need to worry about any patent restrictions. So why not a linear aerospike for instance? As another commented on the possibility of mixing the easiest (cheapest) machined parts with this process, it could make even more difference with some alternative designs. For instance there's that "cold wall vortex" design from Orbitec. If it is as effective as it's supposed to be you might print a low pressure chamber of JB weld! 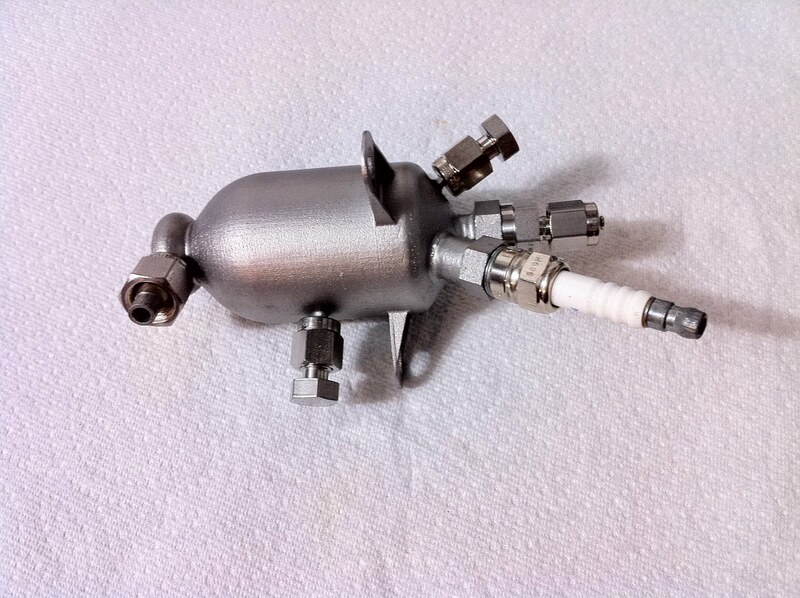 If it is as effective as it's supposed to be you might print a low pressure chamber out of JB weld! Oops. Just realized there's a moderator delay...hopefully 19 iterations of my post don't clog the works. Sorry.